THE SKY IS THE LIMIT. WE ARE RIGHT BENEATH IT. The strength of the corrosion-proof Aluzinc® steel body completed with the elegance of sleek powder coating guarantees a safe home, which radiates the refined taste of the owners for long decades. Combined with strength and durability through innovative manufacturing TwinTile opens new opportunities in today’s roof and façade designs. In our production process, the tiles are first pressed into shape and then coated with 80-micron highly water-resistant polyester powder layer, heated to high temperatures. During the curing process the powder coating melts and forms long chemical chains as it flows together, which results in high cross-link density. This significantly contributes to the tile durability, by creating a surface coating with excelent mechanical properties and resistance even to colour fading. This coating and heating process follows the tile shape forming phase, ensuring a seamless and uniform coating layer which prevents micro cracks that may occur in in bends of steel tiles that are coated before pressing or roll-forming. Their long lifespan means that you will not have to replace TwinTile products for at least a few decades, which results in a lower burden on the environment as no new roofing work is needed. The products are also made of steel that can be recycled in the same way as steel cans or vehicle parts. The powder coating on our roof tiles is more environmentally sustainable in comparison with liquid coating, since it contains no solvents that pollute the environment. 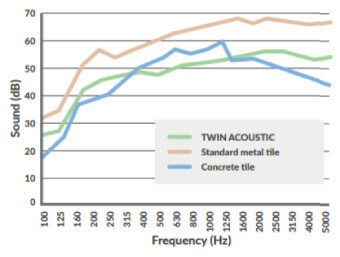 Sound suppression measurements at the CSTB Institute have proved the acoustically insulating TWIN ACOUSTIC roof tiles to be equal to concrete roof tiles, and perform significantly better than standard metal roof tiles. The results are shown in the chart below. As well as the internal tests, ongoing external tests are carried out on the TwinTile by the official quality partners (ATG approval). Our roofs have been exposed to so-called ‘accelerated ageing’ in laboratories. After 5,000 hours, equivalent to 10 years of actual exposure to natural elements, there was no noticeable difference in the tile colour. No. All TwinTile products are made of Aluzinc®. Aluzinc® is a steel that is coated with alloy of 55 ％ aluminum, 43,4 ％ zinc and 1,6 ％ silicon. The excellent corrosion resistance of Aluzinc® is attributable to the properties of the two components: on the surface of the cladding, aluminium functions as a barrier against corrosive substances and the zinc protects the steel via the “sacrificial effect”. The surface of the metal coating is protected by a fine layer of aluminium oxides, which provide a lasting sheen. As well as good corrosion resistance, thanks to the hard surface it also exhibits a high scuff resistance and has excellent reflective properties for heat and light. By opting to work only with quality raw materials, there is a 30 year guarantee. Given that all products are anchored in place together and they are also mechanically nailed into place in the support structure, the system will definitely not blow away. The systems have been specially developed in order to stand up to the most extreme weather conditions and this has been proven worldwide over many years.